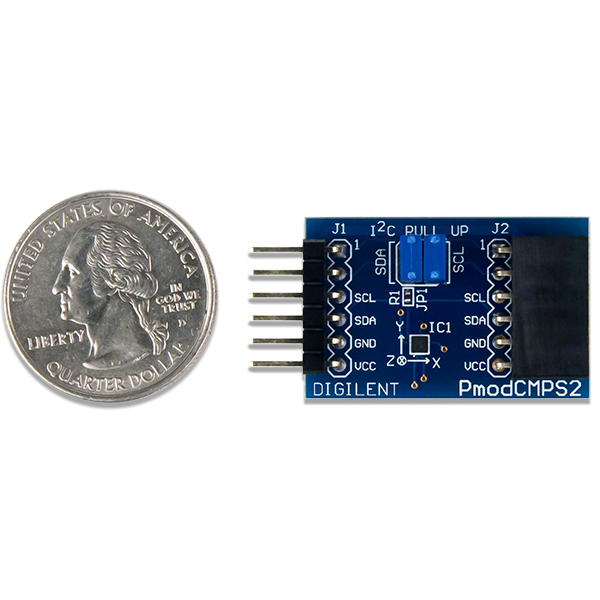 The Digilent Pmod CMPS2 (Revision A) is a 3-axis anisotropic magneto-resistive sensor. With Memsic's MMC34160PJ, the local magnetic field strength in a ±16 Gauss range with a heading accuracy of 1° and up to 0.5 mG of resolution. The pins on the pin header are spaced 100 mil apart. The PCB is 1.25 inches long on the sides parallel to the pins on the pin header and 0.8 inches long on the sides perpendicular to the pin header. The Pmod CMPS2 utilizes the MMC34160PJ to collect magnetic field data. While communicating with the host board via the I²C protocol using an I²C address of 0x0110000/ users can measure the ±16 G field surrounding the device. The Pmod CMPS2 communicates with the host board via the I²C protocol. By first sending the 7-bit I²C device address of 0110000 and then a read/write bit (high/low logic level, respectively), followed by the register address of interest at a maximum clock frequency of 400 kHz users can both configure and read from the Pmod CMPS2. 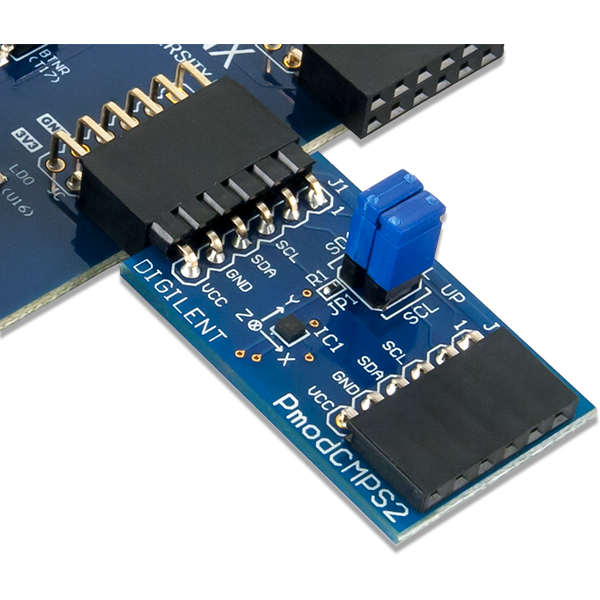 An additional set of pins on header J2 is provided so that users may daisy chain the Pmod CMPS2 with other I²C devices. Each Cartesian axis has two registers to store the high and low data bytes for each measurement. The data registers are arranged in a low byte, high byte arrangement. Rd_Done  Rd_Done 0¹ Indicates that chip was successfully able to read its memory. Pump On  Pump On 0¹ This bit indicates the status of the charge pump. RSV  Meas Done 0¹ Indicates that a measurement event is completed. Here is the series of commands to acquire a set of magnetometer data from the Pmod CMPS2 via pseudo I²C code. Power on the Pmod CMPS2 and wait for 10 mS before further operation. Wait to receive an ACK from the Pmod CMPS2. Write the command to take a measurement by setting bit 0 high followed by a STOP bit. Delay at least 7.92 mS by default to allow the Pmod CMPS2 to finish collecting data. Cycle the SCL line to receive the Status Register data on the SDA line. Keep reading the Status Register by repeating steps 8 through 13 until bit 0 is set to '1', indicating that the data on all 3 axes as available to be read. Send the first register address corresponding to Xout LSB (0x00) as the register to be read. Cycle the SCL line to receive the data bits from the X, Y, and Z registers in the SDA line, providing an ACK between each data byte. 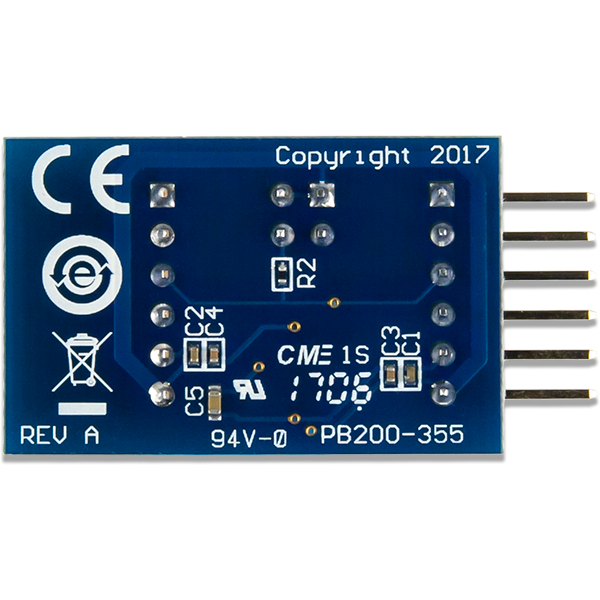 The Pmod CMPS2 address pointer automatically moves to each consecutive byte. End the communication by sending a NACK followed by a STOP command. Convert the readings into usable data. More details are available in the Data Conversion section. Wait 1/3 of the acquisition time (by default 2.64 ms) before performing another measurement. The Pmod CMPS2 is an ideal Pmod to use as a compass. Like all compasses, it is recommended that the Pmod CMPS2 is calibrated before using the module. To calibrate the magnetometer, the offset associated with the magnetic sensors and the environment needs to be calculated and removed from future measurements. Write the command to recharge the capacitor to prepare for the SET action. Delay at least 50 mS to allow the Pmod CMPS2 to finish preparing. Write the command to start a SET action. Delay at least 1 mS to allow the Pmod CMPS2 to finish the SET action. Each of the readings will contain the external magnetic field H in addition to offset associated with the current put through the coil by the SET action. Now a RESET action will be performed to reverse the magnetization for the sensing resistors to get the inverse offset value. Write the command to recharge the capacitor to prepare for the RESET action. Write the command to start a RESET action. Each of the readings will contain the external magnetic field H in addition to offset associated with the current put through the coil by the RESET action. The offset associated with the device can be calculated and then subtracted from future measurements to obtain the actual magnetic field. The other method of calibration is to remove the hard iron bias introduced to the magnetometer by the surrounding environment by measuring (either continually or for a set time) all of the possible magnetometer readings in a Cartesian sphere and keep track of the highest and lowest readings for each axis. The offset can then be calculated in the same fashion as described above with the SET and RESET actions. The advantage of this method is when the Pmod CMPS2 is continually changing locations or when other external magnetic fields may be introduced into the test environment. The Memsic MMC34160PJ provides data for each axis in units of Gauss, but the information is generally more legible when presented as a compass heading. The method for converting Gauss units to a compass heading is provided below. Calculate the real Gauss value for the X and Y axes from the amount of LSBs returned where the LSB value by default is 0.48828125 mG, resulting in 2048 LSBs per Gauss. Calculate the direction D by first checking to see if the X Gauss data is equal to 0 to prevent divide by 0 zero errors in the future calculations. If the X Gauss data is 0, check to see if the Y Gauss data is less than 0. If Y is less than 0 Gauss, the direction D is 90 degrees; if Y is greater than or equal to 0 Gauss, the direction D is 0 degrees. If the X Gauss data is not zero, calculate the arctangent of the Y Gauss and X Gauss data and convert from polar coordinates to degrees. If the direction D is greater than 360 degrees, subtract 360 degrees from that value. If the direction D is less than 0 degrees, add 360 degrees to that value. When using an external power supply to run the Pmod, be sure to stay within the parameters provided in Specifications. The schematics of the Pmod CMPS2 are available here. 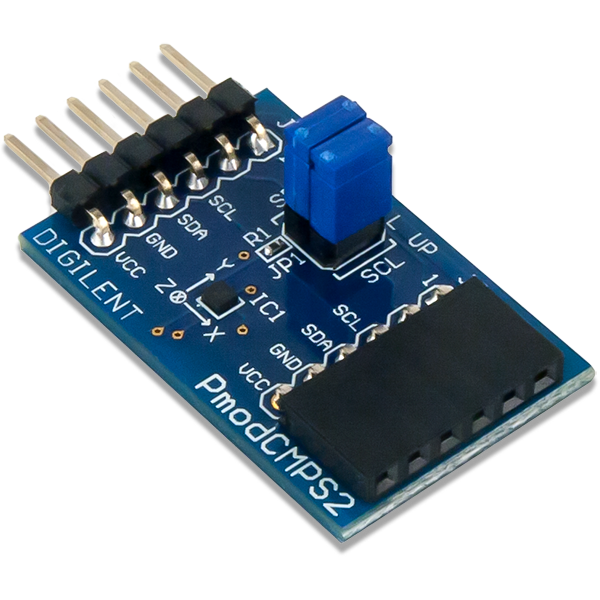 Additional information about the humidity sensor including communication modes and specific timings of the chip can be found by checking out its datasheet here. Example code demonstrating how to get information from the Pmod CMPS2 can be found on its Resource Center here. 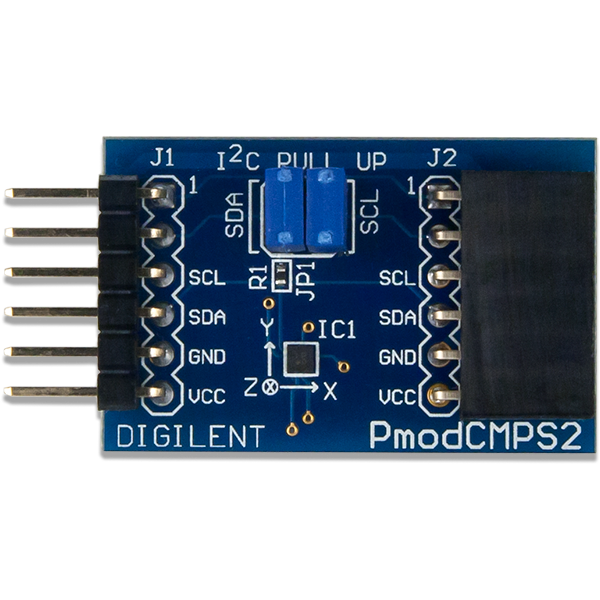 If you have any questions or comments about the Pmod CMPS2, feel free to post them under the appropriate section (“Add-on Boards”) of the Digilent Forum.